The weather was fantastic today in Cozumel. Air temp mid-80 but very humid. Sunny and calm seas. The water is warm, 83F, and a 2mm shorty is almost an overkill.... Can you imagine I showed up here with a 5mm. I was told a few weeks ago that the water was getting colder and it was time to dig out the 5mm.... That was probably only for a couple days before the current heat wave... This is our first day of diving with Alison and Carlos this week. They’ve painted the Maximus earlier this month and she’s all white and clean with nice lettering on her. We were 7 divers in addition to Alison and Orlando. Chace from Oklahoma City, a group of 4 from Kim, Joe, Sarah and John, the first birthday boy, and ourselves Nathalie and JF, the other birthday boy. 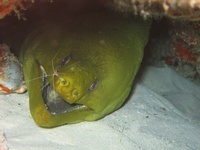 We did 3 great dives: Santa Rosa Wall, Paso del Cedral and Las Palmas. The current was pretty strong today about 1 knot and hard to swim against. We saw nice marine life. 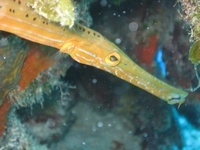 Among other, a nurse shark sleeping, many turtles of all sizes, yellow stingrays, humongous crabs, spiny lobsters, groupers, many schools of different kind of fishes. On our last dive, we found a lion fish on Las Palmas. According to Alison, the first one was spotted about 9 months ago (about the time I was here in January) and since then, they’ve been catching a few every week. Compare to the ones I have seen in the Bahamas, this one looked like a dwarf. Nonetheless, this is such an invasive specie that whenever they can catch one, they get it our of the water... The stats for the day are (0:52, 73ft, EAN32), SI 1:27, (1:06, 56ft, air), SI 1:26 and our last dive was abruptly interrupted by the lion fish chase for a profile of (0:55, 68ft, air) coming back on board with about 1000psi. To our surprise, after Santa Rosa wall, we met a mermaid on the Maximus. Carlos picked her up while we were submerged... Once we were all on the boat, we headed to Palancar beach to eat a birthday cake and beat the mermaid to death. Nathalie gave the final stroke and plenty of candies came out of her belly and fell on the ground... 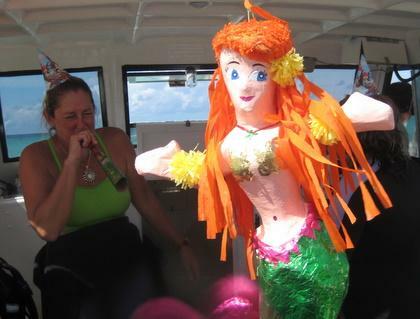 This was so cool of Alison to bring cake with candle, birthday hats, blowers and obviously our mermaid pinata. Tomorrow we’re planning again 3 dives with the same group. Hasta Manana!